Have you seen this giant nose? A two-foot-tall, 50-lb. 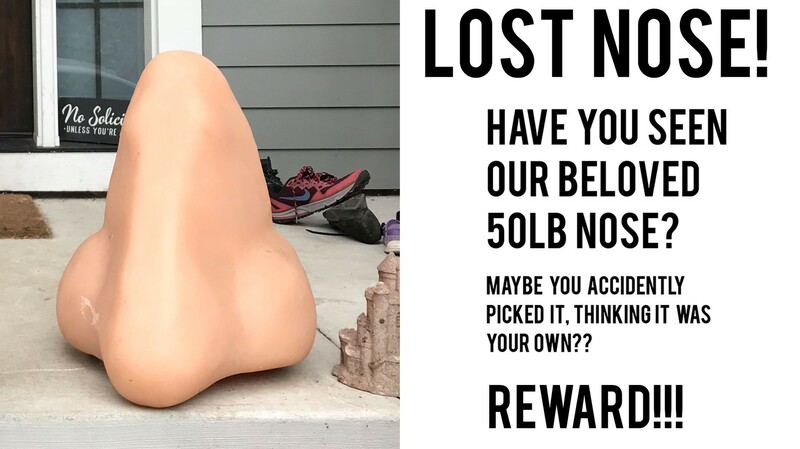 nose prop went missing overnight Sunday in Portland, Oregon and its family just wants it back. "We woke up this morning and the nose was gone," Delia Albert said. Delia Albert said her husband, who works for an advertising agency, rescued the nose out of the trash a year ago. It was a discarded prop from a photo shoot, though she wasn't sure what campaign had used it. Since last October, it's been sitting on their front porch. The couple's kids, ages 5, 7, and 11, were devastated at the loss of their nose. "They burst into tears, super upset, couldn't believe somebody would take something that didn't belong to them," Albert said. "We didn't realize how attached they were to it. It really clearly brought them a lot of joy." ...Her 11-year-old son pledged to bolt down the nose if it found its way home. The kids also plan to post missing fliers around the neighborhood with reward money they collected among themselves of $6.27. Albert said she did file a police report about the nose, at her children's insistence. On the value of the stolen item, she wrote, "priceless." If YOU'VE seen this oversized nose, contact Albert at deliavalbert@gmail.com with details.